We had a leisurely Sunday afternoon lunch, and the cakestands got to make an appearance. Normally I have them distributed here and there throughout the apartment, so I had to hunt to gather them all up. They're being loaned out this week, so I had them all spread out so we could pick and choose. 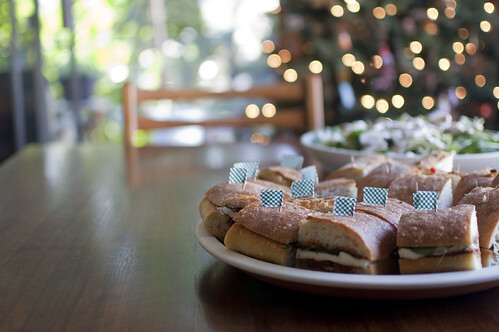 The washi tape flags were a last minute addition to designate the vegetarian sandwiches from the rest. I didn't have time to make dessert, but we made do with a bowl of satsumas and some really good coffee. I'm still mostly caffeine free, but I'll generally give myself one day a week to enjoy coffee and one cup of tea per day. So far, so good. A last minute trip to the Getty with just enough time to catch the crazy sunset and see another of the Pacific Standard Time exhibitions. We left at closing and walked down to our car instead of taking the tram, enjoying the moonlight. 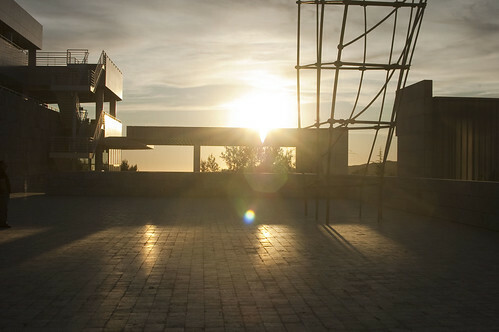 I spent most of the summer in L.A. but never made it to the Getty, which I was a little bummed about. Your photos of it are beautiful and only make me want to go even more next summer! Where did you get all of those adorable cake plates?! I've been desperately trying find a cute one for awhile now but all I seem to find are plain boring stands. Such a great collection! 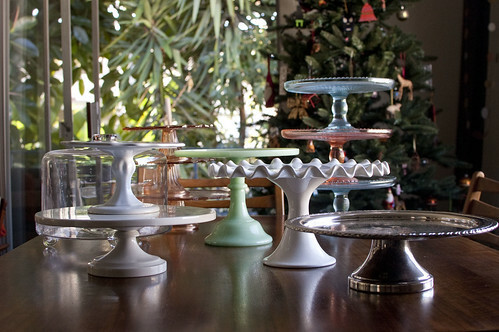 What a gorgeous cake stand collection! CAKE STANDS! I'm so jealous. Em and I had a cake stand conversation the other day, regarding our registries. "I have narrowed our registry down to the point where it only contains ONE simple, clear glass cake stand." "You didn't have to do that. What's a cake stand?" "Well, my mom asked why it was necessary to register for six different cake stands, so I thought I should narrow it down." "No but really...what's a cake stand for?!?!" Rachel, you are my favorite, seriously. What a wonderful collection. I went for this, but a larger size on amazon because of the 4 for 3 deal...and while I love lots of colored things, I wanted to start my collection with white. i love the getty museum. the views are so gorgeous. i love how these photos shifts from greens to blues. happy tuesday. 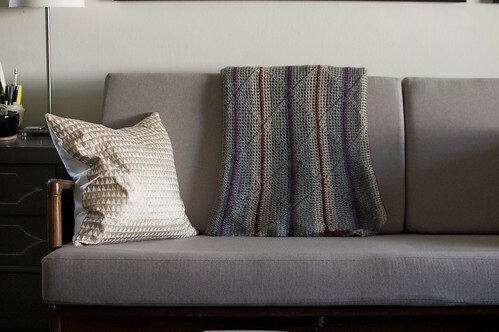 Wow, I love the throw on your couch- would you share where it came from? Ooh, I love your cake stand collection! My fiancé and I started our registry this weekend, and we included a modern little domed one, but I'd love to expand someday and pick up a few more interesting looking ones! What great pictures, Rachel! I Love them! @ RosyRilli - The cake stands are from all over! I have a problem. Many of them are from flea markets or thrift shops and a few are new. I think if you search "cake stand" on here, I might have even more info about them. I'm obsessed. @ Meaghan - How can she not know?! They're for being beautiful of course, and sometimes for nicely displaying baked goods (or strange ceramic babydolls, in our house). P.S. While you're registering, you might want to check out the Martha Stewart collection at Macy's. They have the simplest, most lovely white cake stands every year and the prices are reasonable. @ Bridget - Such a good one to start with! The plain white ones are perfect for so many things - probably the smartest ones to buy. @ Sarah - my mom crocheted that afghan while she was pregnant with me! It must have taken her forever - it's all single crochet stitches in a really beautiful pattern. I love it. 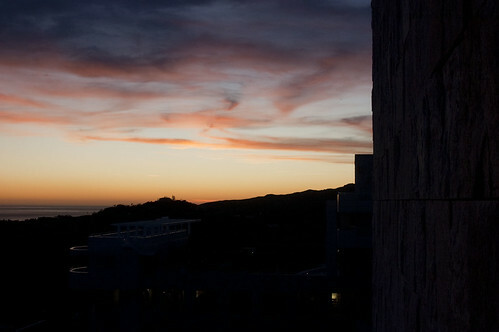 Oh those images of The Getty at dusk make me heartsick in a good way. I was going to ask about the throw as well - what a special gift from your mom! 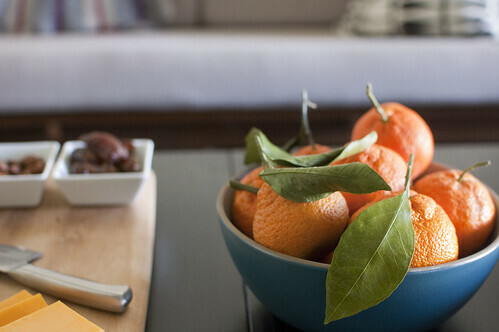 I also like the blue bowl - is that Heath Ceramics? Or something else equally as cool? @ Erika - Yep. The blue bowl is by Heath. We have a nice little collection of serving pieces from them and I love them more every time I use them. What an amazing collection of photos! Looks like a great weekend. I love your cakestand collection, what a fun hobby! 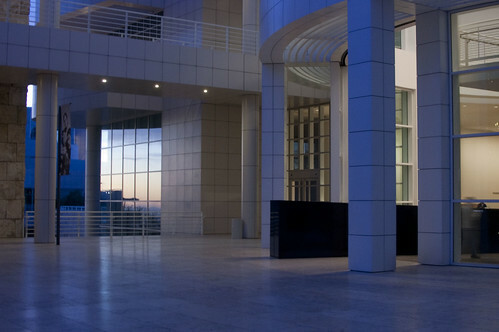 Your cake stand collection is beautiful, and your picture of the Getty at twilight is picture postcard perfect! I just got my first cake stand for a secret santa gift and I am in love with it! Clear thick glass with a dome top. I left it on the counter for three days to admire before the boy-man told me I needed to put it away for "counter space" or something. Growing up my mom had all these green depression glass platters or scone trays (from the gma), but never a cake stand so this will complement the collection perfectly! p.s. I really enjoy reading your blog. I think this might actually be my first comment, but a several-months-long reader at this point. Just in case any of your readers are interested in the pattern for the afghan, I still have it. It does take forever, but it's simple and lends itself to all manner of variations. I like the thought of others getting as much comfort and pleasure out of one of their own making as we have through the years. Let me know if you'd like me to share. P.S. - I used hand-spun wool from Finland. A chore to block after washing, but supple and long-lasting. So many pretty cake stands! Love the light you get at your dining table. 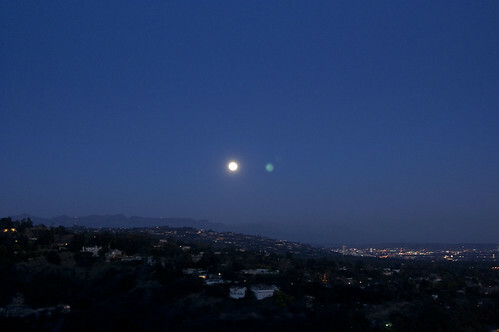 I miss the Getty, it's been ages since I've been up there. Need to go! What an amazing cake stand collection. I'm incredibly jealous! :) Just discovered your blog via Elizabeth at Please Note.. very nice!